UPDTAE: Deadline reached, competition is closed now – all winners have been notified. To be in with a chance of joining Gernot, Sebastian and surely a whole raft of techno’s great and good, simply send us an email to community@electronicbeats.net (with the subject “We are Modeselektor” OR sign up to the EB newsletter—you can do this by entering your email address into the box on the right hand navigation bar. We’ll be giving away six pairs of tickets per day—generous we know, so get form fillin’. As eagle-eyed visitors to our website may have noticed, Modeselektor have a movie out. We Are Modeselektor is a feature-length documentary telling the story of how two guys from Rüdersdorf and Woltersdorf went on to conquer the world, party by party. 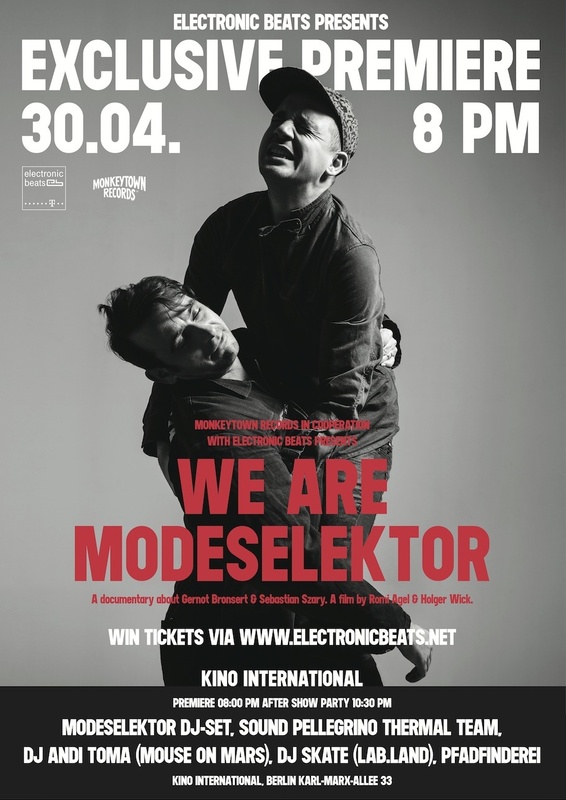 Over the next ten days, we’ll be giving away tickets to the exclusive world premiere of We Are Modeselektor presented by Electronic Beats which takes place on April 30th at the Kino International, Berlin. As well as being among the first people to see the film, winners will also be granted access to the aftershow party where Modeselektor themselves will be behind the decks, flanked by Sound Pellegrino Thermal Team, Andi Toma (of Mouse on Mars—watch the Slices interview here), Skate, with visuals handled by Pfadfinderei. Miss out? Can’t get to Berlin? Below is the full schedule for screenings throughout Europe. We Are Modeselektor will be released on May 3rd, through Monkeytown Records on DVD and BluRay.